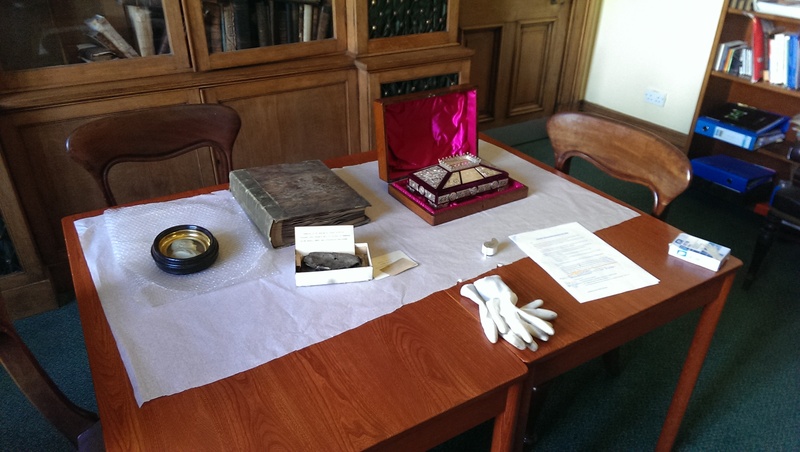 A guest post from Liz Louis, student on the MLitt in Museum and Gallery Studies at the University of St Andrews and volunteer at New College Library Object Strongroom. Liz presented on a selection of New College objects as part of the Behind the Scenes at New College Library Innovative Learning Week event. 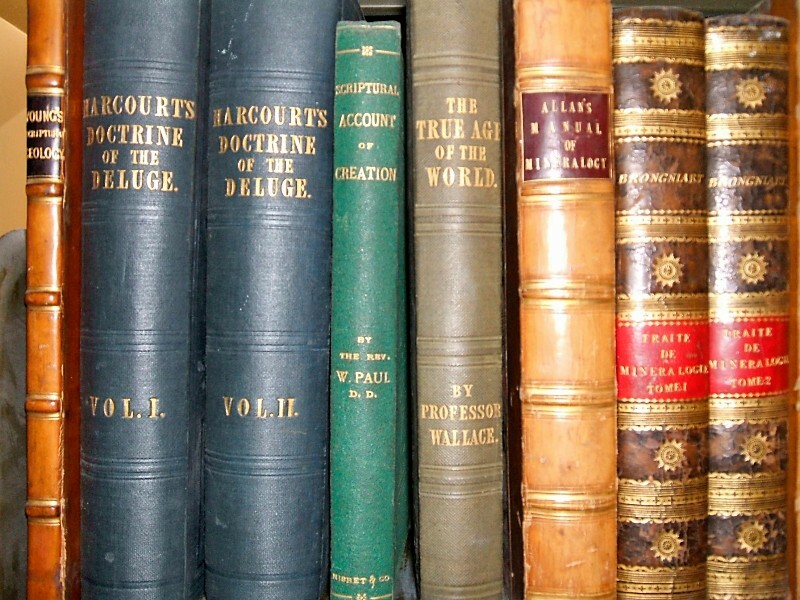 I want to show you some of the highlights of the collection and also how the resources which New College Library can provide us with are invaluable to my research. New College Library’s impressive holdings on Thomas Chalmers, chair of theology at Edinburgh University and first Principal of New College include many portraits of Chalmers in the form of paintings, photos and prints. As an art historian, the Wax Relief Portrait of Thomas Chalmers is interesting because it is intensely sculptural and ‘photorealistic’: with wax best suited to imitate human skin and most eerily similar to the moment of arrested life. No paper trail for the original paper has been discovered as of yet, although I have found a label which suggests that the portrait was made by Mme Tussaud’s. We do know that it was given to Prof Hugh Watt (Principal 1946-50) by Margaret Macphail, who was given the object by her friend who inherited it from Chalmers’s goddaughter. Many objects in the strong room reflect the nineteenth century interest in sciences. The album with dried plants has a handwritten inscription on first page: In Memoriam / A Flower, a Plant, or a Weed, / gathered from every place/ mentioned in the Bible / which I visited in Palestine / 1852 / W.D. (William Dickson) 1852. This makes it particularly interesting for us: we’re not often lucky to have name and date of objects ON an object. We know that it was donated by his sons to complete New College’s Dickson collection of objects related to Middle East. It was addressed to John Duns (Professor of Natural Science at New College, 1864-1909). To a modern eye one thing that stands out is that the names written in pencil next to the plant never refer to the plant itself, but always to the place where it was found, e.g. ‘Place where they stoned Stephen’; ‘Gethsemane’. 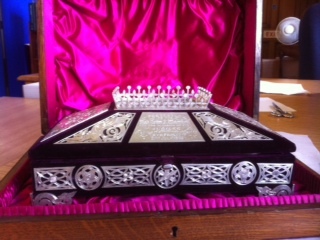 And finally one of our favourite objects, a casket presented to the Rev. John Sinclair McPhail. 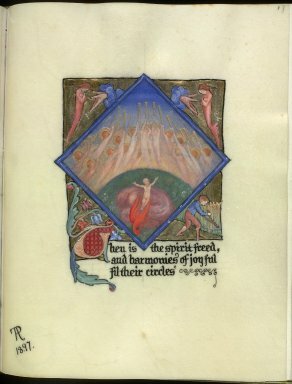 It contains an illuminated letter from the Members of the United Free Presbytery of Skye congratulating McPhail on his 50th anniversary of being ordained, praising his devotion and adherence to the Church’s Principles as well as his personal qualities and ‘sound wisdom’. It’s one of the few objects in the collection that we know when and where it was made thanks to the marks. We know where because of the Assay mark is applied by the Assay Office as a guarantee for the purity of the precious metal (here: silver) according to national and international standards. The casket’s mark has three towers with one at front and two at back, the symbol of the Edinburgh Assay Office. We know when from the assay mark, indicated by a single letter and font – here, sans serif Y: probably 1880-1. And we know who made it from the maker’s mark MC&Co = Mackay,Cunningham and Company, Edinburgh, in the second half of the nineteenth century. In addition, the sovereign’s head, (in this case profile of Queen Victoria) aka duty mark certifies payment of tax to the Crown; Scottish thistle=silver standard mark: Sterling .925 for Edinburgh. All of this shows how objects can begin to tell us stories if we know how to read them. So why are we doing all of this? Firstly, to establish and record the collection that New College Library holds. This should enable collaboration with other institutions through shared knowledge and resources, and also enable preservation of sensitive objects and information about them as ethical obligation towards future generations (so nobody has to do my job all over again). Revealing the hidden stories should enable the University student and staff community to access basic information on objects as part of their own research, and make objects available to researchers for exploring new topics. Michael Marten, Attempting to Bring the Gospel Home. Scottish Missions to Palestine, 1839-1917 (London & New York: Tauris Academic Studies, 2006), pp.9-26.12. 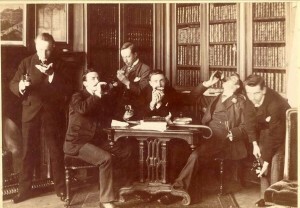 Student cataloguers who worked on the 1893 printed library catalogue. 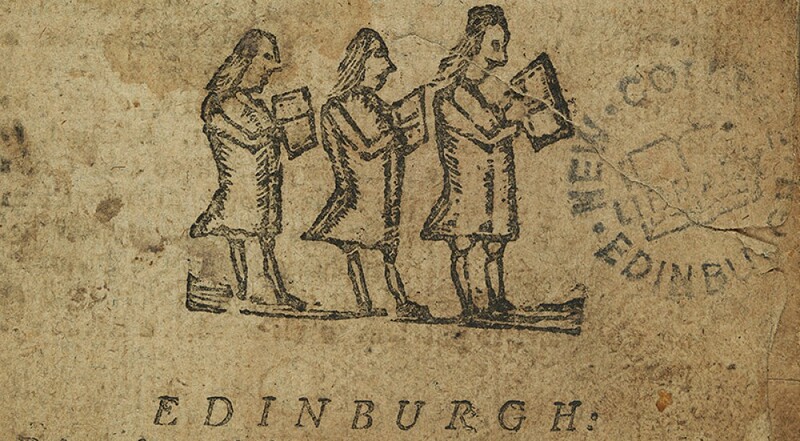 Image from New College Library Archives. There’s still time to come to the Innovative Learning Week Session : Library Pecha Kucha – Our Favourite Things. Six members of staff will be allowed just 5 minutes to present their work to you. 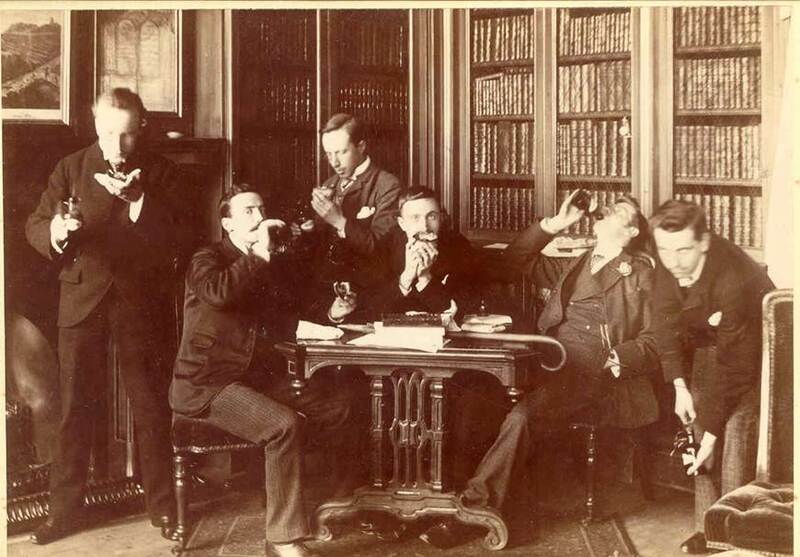 I’ll be presenting on the hidden faces of New College Library, showing that New College Library’s collection story is not just about men and ministers but also women, ordinary people and students. The session is today, Tuesday 18 February, 11.30-12.20, Main Library – Room 1.11.